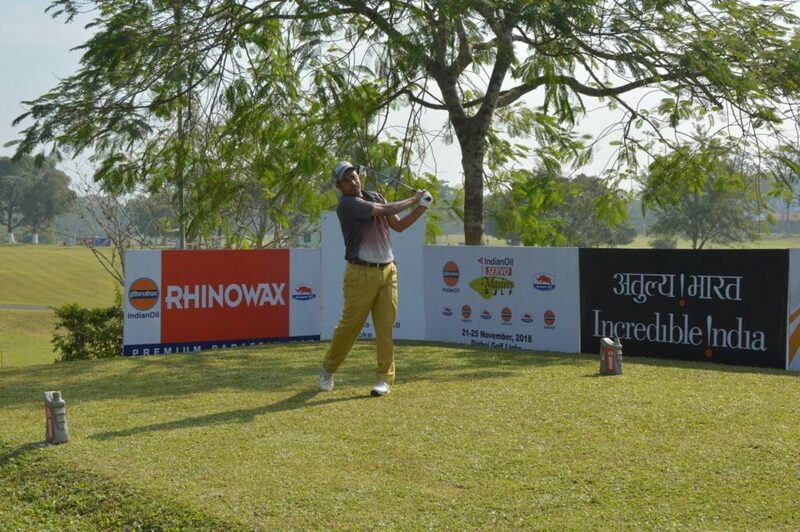 Digboi, Assam, November 23, 2018: Delhi’s Shamim Khan strengthened his claims for a title defence at the IndianOil Servo Masters Golf 2018 after he fired the tournament’s best round of seven-under-65 on day three that catapulted him into a commanding four-shot lead at 11-under-205 at the Digboi Golf Links. Kolkata’s Mohammad Sanju, the halfway leader by four shots, dropped to tied second at seven-under-209 after posting a score of 76 on Friday. Sanju was joined by Chandigarh’s Harendra Gupta (72) and Noida’s Gaurav Pratap Singh (69) in tied second. Shamim Khan (70-70-65), who was seven shots off the lead in tied fourth at the halfway stage, had a sedate front-nine on Friday as he exchanged two birdies for a bogey. The 40-year-old reigning PGTI Order of Merit champion then began turning on the heat on the back-nine as his putter was on fire. Khan, a two-time champion in Digboi and the current holder of the trophy, picked up a birdie on the 11th and followed that up with an astonishing streak of five successive birdies from the 13th to the 17th to emerge as the prime contender for the title. Shamim, one among only two players along with Om Prakash Chouhan, to have returned three under-par scores so far this week, sank a 40-footer on the 14th and also four other putts from a range of 12 to 20 feet on the back-nine. Khan, who is currently ranked 15th in the PGTI Order of Merit, said, “It was all about those long putt conversions on the back-nine today. After the birdie on the 11th I was feeling good about my game and felt like I could go deep. The good memories from last year helped for sure. “The greens at this course have really improved over the years and are rolling well. But short putts still hold the key. I feel even a four-shot lead is not enough if one can’t hold those short putts. Mohammad Sanju, the leader for the first two days, slipped one spot to tied second after signing for a 76. He was one-under through the front-nine but then conceded five bogeys on the back-nine as a result of a number of missed putts from short range. Harendra Gupta too missed a lot of opportunities on the greens during his round of 72 that featured three birdies, a bogey and a double-bogey. Gupta, sole second after round two, is now tied for second. Gaurav Pratap Singh moved up two places to tied second thanks to a round of 69 which saw him make six birdies and three bogeys. Om Prakash Chouhan (70) of Mhow was in fifth place at six-under-210.